Let me begin by simply thanking everyone who reached out after the first newsletter with kind words and offers of support. It was not my intent to solicit such, but it was very much appreciated and the affirmation simply reinforced these newsletters as a positive approach to make sure that all of you are kept well abreast of the happenings here at Richard Best Custom Homes. I also greatly appreciated those that reached out with questions and service requests because of the email. I had hoped that the newsletters might become a conduit for conversation and it appears in that regard that this was a resounding success. Another area of emphasis has been our Punchlist procedures, and so I wanted to concentrate on that in this installment of the Newsletter. Below you will find some more information about our key punchlist personnel, Butch Hillman and Shelby Freund. Last year we shifted our Punchlist and Warranty concentration from a superintendent-based system to having this dynamic team take it over completely. With Shelby in the office to coordinate trades and Butch in the field knocking it out, we have seen Punchlist completion times improve, response times to Warranty requests significantly diminished, and the level of communication and client satisfaction throughout the process grow. While we are always trying to improve in all facets of the construction process, the significant improvement in this area has been striking, and so I wanted to introduce these excellent employees to you for those who have not already met them. Finally, in the last newsletter I mentioned the total number of employees, but I realized that providing a roster might help get an understanding who all is involved in the day-to-day operations here at the company. Please find this list on the sidebar along with their job titles. Once again, thank you for everything you have done for myself and for Richard Best Custom Homes. As always, please do not hesitate to reach out to me directly if I can ever be of assistance to you. 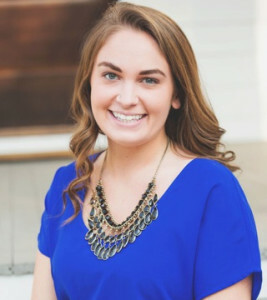 Shelby joined the RBCH team promptly after graduating from Georgia Southern University in the Spring of 2014 with a Bachelors degree in Business Management and a minor in Marketing. Her attention to detail and work ethic are her two biggest strengths, and she has continued to impress me with her quick grasp of the punch list process. She has truly bought into the mission here at RBCH, which is to provide the ultimate level of customer satisfaction on to every job. She is originally from Bridgeton, New Jersey but has spent the past 11 years in Brunswick, Georgia until her recent move to Pooler, Georgia. She spends much of her time with her family and friends as well as volunteering at her local Humane Society. 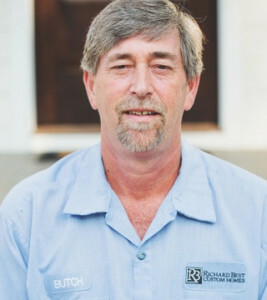 Butch is a native of Savannah, Georgia and has over 28 years experience in the construction industry. He started out working on a framing crew, installing siding as well as some occasional interior trim. That eventually led him to a Savannah-based lumber and millwork company where he headed up the closet shelving and window installations, before being promoted to oversee up the entire door and millwork shop. Butch joined our team in January 2014 and immediately made an impact. Due to his vast knowledge of products and the construction process, Butch can either make the repairs himself or he knows right where to go to get the items taken care of. He is an easy going, approachable guy but most importantly, he gets the job done. He lives in Rincon, Georgia and has two children, 23 year old Seth and 16 year old Stacy Leigh. Outside of work, he enjoys camping and fishing.